SCHOOL PLAY, Children's Christmas Musical Play. Dramatic Play, Small Cast, Sadako & paper cranes. ONE ACT PLAY, Medium Cast, Sadako & cranes. SCHOOL PLAY, Large Cast for young performers. Children's Play, Small Cast, audience participation. Children's Play, Medium Cast, aud. participation. ONE ACT PLAY, Small Cast, Amelia's life, flight. ONE ACT PLAY, Small Cast, Annie's life. Children's Play, Small Cast, children's dreams. Children's Play, Small Cast, self-esteem play. Children's Play, kids tell haunting real life stories. Children's Musical Play, confidence, self-esteem. Children's Play, boy on an enchanted island. ONE ACT PLAY, Small & Medium, King Arthur. ONE ACT PLAY, Small & Medium, Author's life. ONE ACT PLAY, Hilarious Halloween Comedy. Dramatic Play, Central American legend. Dramatic Play, A Bicentennial of Discovery. 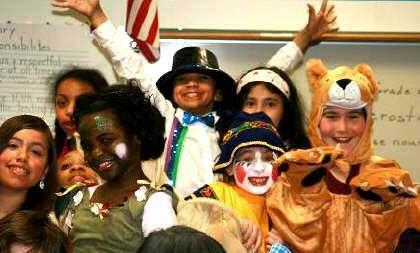 SCHOOL PLAY, Children's Musical Play! ONE ACT PLAY, Tom Sawyer, Huck Finn & more. Small Cast, Appalachian stories and folk tales. ONE ACT PLAY, Edgar Allan Poe drama, writings. Full Length, Large Cast, for Jr & Sr High Actors. ONE ACT PLAY, Small Cast, Classic, Civil War. ONE ACT PLAY, Scenes from the Bard for kids. ONE ACT PLAY, Drama, grandfather's last gift. Children's Play, Small & Medium, participation. ONE ACT PLAY, Small Cast, Inventor's life. Children's Play, Children hitch a ride to future. ONE ACT PLAY, Cherokee removal from homeland. Children's Christmas Musical Play! Christmas skit. SCHOOL PLAY - Life of Martin Luther King, Jr.
ONE ACT PLAY, Vietnam Veteran's memories. Small Cast, Tall Tales, Midwest stories, poems. ONE ACT PLAY, Caribbean boy comes to America. Dramatic Children's Play, girl's triumph over grief. Children's Play, Cherokee life, culture & myths.